Citation Information: J Clin Invest. 2017;127(10):3588-3590. https://doi.org/10.1172/JCI96962. 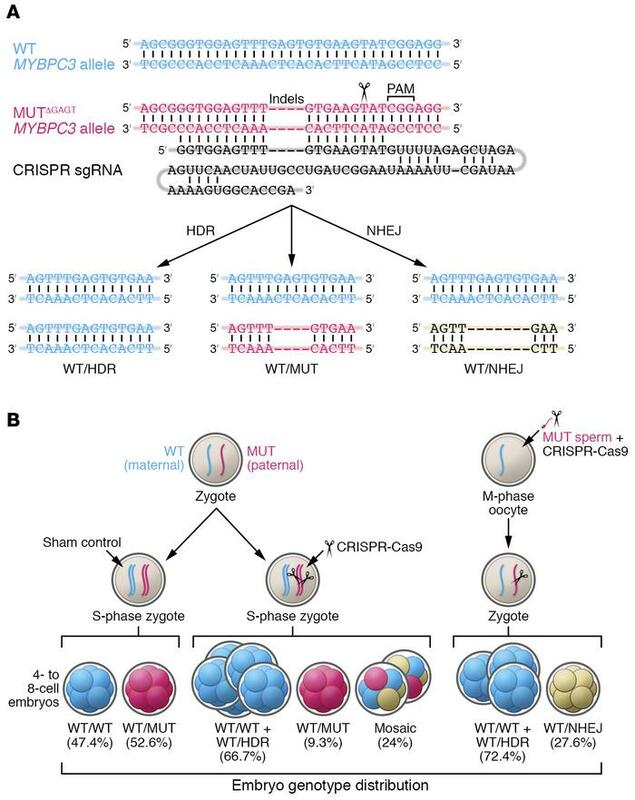 Genome editing of the MYBPC3ΔGAGT mutation by CRISPR-Cas9 and sgRNA injection into human embryos. (A) (Top) Diagram of the WT and mutant (MUT) alleles and the sgRNA that specifically targets the mutant sequence. (Bottom) Possible genotypes from the editing of the paternal MYBPC3ΔGAGT mutant allele using CRISPR-Cas9 with and without ssODNs. (B) Blastomere genotype distribution in 4- to 8-cell embryos, arising after injection of CRISPR-Cas9 either into human S-phase zygotes or into M-phase MII oocytes. Because the sperm donor was heterozygous and the egg donors WT, about half the cells in control embryos were fully WT and half heterozygous. The paternal mutant allele is preferentially corrected using the homologous WT maternal chromosome in human embryos rather than the ssODNs provided by the investigator. Figure modified with permission from Nature (1). HDR, repaired allele resulting from homologous recombination that is indistinguishable from WT; NHEJ, insertions and deletions resulting from nonhomologous end joining; PAM, protospacer adjacent motif; sgRNA, single guide RNA.